Unless you are an art historian, you likely don’t know the name Feodor von Luerzer. Don’t feel bad—most art historians probably aren’t too familiar with his work either. But you may be already familiar with his work, especially if you’ve been to Duluth’s oldest operating restaurant. The Austrian-born landscape painter lived in the Zenith City from 1889 to 1909 and while he was here he painted local scenes, operated art studios in downtown Duluth, and made August Fitger a little less homesick. Von Luerzer was born on February 14, 1851, in the Austrian Province of Salzburg. His father was the district forester, and von Luerzer, being the oldest son, was expected to take over that position. But von Luerzer was interested in art, so following several years of service in the Austrian military he enrolled in the Vienna Art Academy to study painting. After spending some time traveling through Europe, von Luerzer immigrated to the United States about 1886. Like many artists from Europe, he found work in Milwaukee, Wisconsin, as a panorama painter. The panorama, or cyclorama, was a giant painting produced by dozens of artists, often depicting a famous battle or religious scene. While von Luerzer was in Milwaukee in 1886 and 1887 he reportedly worked on the panorama of the Battle of Gettysburg. In late 1887, he moved to Cleveland, Ohio, where he had an art studio for a couple of years. Von Luerzer left Cleveland by canoe in the spring of 1889, heading west on Lake Erie. In the fall of that year, he arrived in Duluth; he apparently liked the city and decided to stay. He rented a room on East Superior Street and opened an art studio in the Ingalls Block at 105 West Superior Street. By 1891 he had moved his studio to the Pastoret-Stenson Block on First Avenue East and Superior Street and was residing at the Braeutigan Summer Garden, on the shore of Lake Superior between 29th and 30th Avenues East. Adolph and Louisa Braeutigan came to Duluth with their children in the late 1870s. They had both emigrated from Germany to Wisconsin and were married there in 1868. Adolph worked as a butcher and a tanner, but in the mid-1880s he opened the summer garden. It was Duluth’s first amusement park and was used as a meeting and picnic area for many local community, work, and church groups. Von Luerzer helped Braeutigan build some structures and decorated them with murals. While in Duluth, von Luerzer maintained a studio where he both painted and gave lessons to groups and individuals. In the mid-1890s he moved the studio to the Temple Opera Block on Second Avenue East and Superior Street, and about 1904 to the original Phoenix Block at Fourth Avenue West and Superior Street. 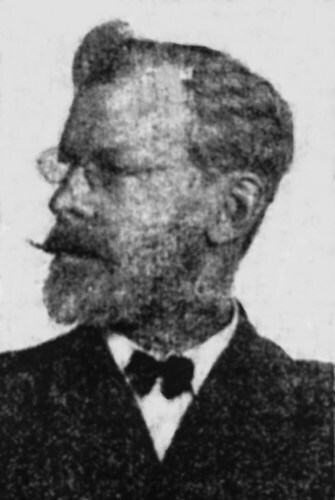 Von Luerzer was also active in Duluth’s Turnverein society. Turnvereins—social clubs that also encouraged training in gymnastics—began in Germany and many German-Americans continued the tradition in the U.S. To join the Turnverein, you had to be at least 18 years of age, be able to read and write in German, and be a U.S. citizen. The Duluth Turnverein, established in the 1870s, built a new hall in July 1888 on the corner of Third Street and Sixth Avenue East, designed by architect Oliver G. Traphagen. In Duluth, von Luerzer painted mostly landscapes. The Minnesota Historical Society owns his 1895 painting Duck Hunters, which depicts two hunters in a duck boat. He also painted scenes of the logging industry. The St. Louis County Historical Society owns two von Luerzer paintings, Logging Scene (1892) and Autumn Landscape with Pond (date unknown). In 1899 he was hired to paint interior decorations in the residence of the Right Rev. James McGolrick, Bishop of the Diocese of Duluth, at 211 West 4th Street. In 1894 von Luerzer and fellow artist and Austrian John Fery, who was in Duluth for a short time, were hired to paint murals in the Brewery Saloon inside the Fitger Brewery. 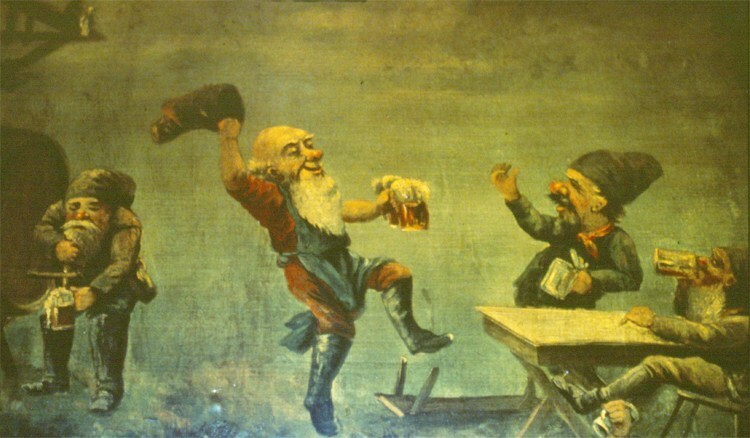 Von Luerzer’s paintings depicted, among other things, elves brewing beer and inebriated monks and a depiction of August Fitger’s boyhood home in Delmenhorst, Germany. In 1914 the murals were moved to the new Brewery Saloon Fitger had built next to the brewery at 508 East Superior Street. The Brewery Saloon later became the Pickwick restaurant, which still operates today. The murals can still be seen in the restaurant’s Dutch Room. Adolph Braeutigan, von Luerzer’s landlord at the summer garden, died in a hunting accident on October 28, 1895, at about 58 years of age. Officials determined that he had tripped on a log and accidentally discharged the gun into his head. Louisa and the children would stay on in Duluth for years. In November 1897, von Luerzer married Ella Braeutigan, Adolph and Louisa’s daughter. On November 11, 1897, von Luerzer took part in the first exhibit of the Duluth Art Club in the French & Bassett furniture store. Other artists exhibiting included David Ericson, Anne Weston, and Alice M. Cook. The 1897 exhibit was the first of many annual exhibits by the Duluth Art Club. In July 1904, the von Luerzers left Duluth on a one-year trip to the western U.S. sponsored by the Northern Pacific and Southern Pacific railroads. Von Luerzer’s assignment was to paint beautiful natural scenes to be used by the railroads for advertising. Also on this trip, von Luerzer had been commissioned by Duluth businessman Robert B. Whiteside to paint Calaveras Grove, a forest of redwood trees in California owned by Whiteside. Whiteside, who had lumber interests, purchased the trees for their timber but ended up preserving them. The von Luerzers traveled by train, on horseback, and by covered wagon through the west and southwest. They returned to Duluth in June 1905 with over 100 sketches, from which the railroad officials chose six to be finished as five-by-three-foot paintings and sent east to be displayed. The Northern Pacific chose scenes of Roosevelt Ranch in North Dakota; Hellgate Canyon near Missoula, Montana; and the Clark River from Cabinet Gorge, Idaho. The Southern Pacific selected paintings of Midway Point near Monterey, California; Santa Cruz Island off the California coast; and the hills of Santa Barbara, California. On returning to Duluth, von Luerzer reopened his studio in the Phoenix Block. The couple’s first child, a son they named Kurt, was born in Duluth on August 27, 1905. Von Luerzer continued to paint and operate his studio in Duluth. In 1908 he sold twelve paintings to real estate magnate Samuel Skidmore Thorpe to decorate the billiard room in his Minneapolis home. It was built of rough pines with balustrades, grillwork and jardinière stands made of knarled [sic] and twisted twigs from the forest. …Our host proved to be Feodor von Luerzer, a noted Austrian artist with manners most gracious. The walls and even the ceiling of the little cabin were literally lined with beautiful canvases, some only partially completed, but all showing the touch of a master. Von Luerzer never made it back to Duluth. He died in Spokane on August 19, 1913, of pneumonia and tuberculosis and is buried in Coeur d’Alene.